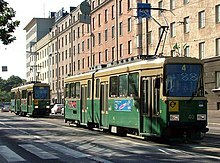 Is í Heilsincí (Fionlainnis: Helsinki, Sualainnis: Helsingfors) príomhchathair na Fionlainne agus an chathair is mó sa tír. Tá sí suite ar chósta theas na tíre, i gcúige stairiúil na Nualainne, agus í ag críochantacht le Vantaa, Espoo, agus Sipoo. B'é Gustaf Vasa, rí na Sualainne, a bhunaigh an chathair ar an 12ú lá de Mhí an Mheithimh 1550 le cuid den tradáil a bhréagadh ó Taillinn trasna na murascaille. D'ordaigh an rí do bhuirgéisigh na gcathracha úd Porvoo, Ulvila (in aice le Pori), Ekenäs, agus Rauma bogadh go dtí an chathair nuabhunaithe, ach ar dtús, bhí na seantraidisiúin tradála ní ba láidre ná briathar cumhachtach an rí féin, agus níor tháinig borradh ar an gcathair nua ach go mall. Sa bhliain 1561, thit tuaisceart na hEastóine, in éineacht le Taillinn féin, leis an tSualainn, agus mar sin, níor iompaigh bunú Helsincí amach chomh tábhachtach agus a shíl an rí Gustaf ar dtús. Mar sin féin, tháinig sí isteach úsáideach mar bhunáit ag longa cogaidh na Sualainne. An áit ina raibh an chathair suite ar dtús, ní raibh sí oiriúnach do longa móra na linne, agus mar sin, hathraíodh Heilsincí go háit ní b'fhearr sa bhliain 1640. Tréigeadh an tseanchathair a bhí suite i mbéal na habhainne úd Vantaanjoki. Inniu, tugtar Vanhankaupunginlahti nó Bá na Seanchathrach ar an áit sin, agus í suite idir na bruachbhailte úd Hermanni, Arabianranta, Viikki, Herttoniemi, agus Kulosaari. Nuair a bunaíodh Cathair Pheadair, agus Impireacht na Rúise ag cúngú isteach leis an mBailt, bhí Heilsincí thíos leis an bhforbairt seo. Le linn Chogadh Mór an Tuaiscirt sa chéad fhiche bliain den ochtú haois, agus an tSualainn is an Rúis ag cur troda ar a chéile, rinne na cathanna, na galair - go háirithe plá na bliana 1710 - agus an fhorghabháil Rúiseach an-léirscrios don chathair. Nuair a chaill an tSualainn daingin na teorainne don Rúis i ndiaidh Chogadh na Hataí sna 170idí, tógadh daingean nua, Sveaborg (Fionlainnis: Viapori go traidisiúnta, Suomenlinna inniu), ar cheann de na hoileáin os comhair Heilsincí. Chuidigh tógáil an daingin go mór mór le forbairt agus le hathbheochan na cathrach, agus an daonra ag fás go sciobtha. Sna blianta 1808-1809, fearadh cogadh eile idir an tSualainn agus an Rúis de thoradh scéimeanna polaitiúla Napoleon. Le linn an chogaidh, rinne dóiteán mór an-léirscrios sa chathair, ach is féidir a rá go ndeachaigh an cogadh chun leasa do Heilsincí. Is amhlaidh gur fágadh an Fhionlainn ar fad ag an Rúis i ndiaidh an chogaidh seo - Cogadh na Fionlainne - agus ós rud é go raibh an tsean-phríomhchathair, Túrcú, suite róchóngarach do Stócólm, d'athraigh Alastair a Dó, Impire na Rúise agus Ard-Diúc na Fionlainne, feidhmeanna na príomhchathrach go Heilsincí. hOrdaíodh don ailtire Carl Ludwig Engel bail a chur ar lár na cathrach arís i ndiaidh an dóiteáin, agus dá thoradh sin, tá cuma Nua-Chlasaiceach ar fhoirgnimh tábhachtacha na cathrach inniu, agus í an-chosúil le Cathair Pheadair in áiteanna. Sa bhliain 1827, bhí dóiteán mór i dTúrcú. An ollscoil a bhí fágtha ag obair sa chathair seo, haistríodh go Heilsincí í anois. Sa dara leath den naoú haois déag, tháinig borradh mór ar an bpríomhchathair nua, agus i dtús na fichiú haoise, bhí céad míle duine ina gcónaí i Heilsincí. Bhain an Fhionlainn amach a neamhspleáchas i Mí na Nollag 1917, ach i ndeireadh Mhí Eanáir sa bhliain dár gcionn, thosaigh cogadh cathartha na Fionlainne. B'iad na Dearga a shealbhaigh an chathair, agus d'éalaigh an rialtas dlisteanach go dtí Vaasa. Ansin, b'í Toscaireacht an Phobail, rialtas na Fionlainne Deirge, a bhí ag rialú i Heilsincí. I Mí Aibreáin, b'éigean don Toscaireacht an chathair a thréigean, agus ar an 13 Aibreán, ghabh trúpaí Gearmánacha faoi cheannas an Ghinearáil Rüdiger von der Goltz Heilsincí. Mí ina dhiaidh, ar an 16 Bealtaine, cheiliúir díormaí na Fionlainne Báine a mbua ar na Dearga sa chathair, agus hiompaíodh daingean Sveaborg ina champa géibhinn do na Dearga. Faoi bhrú an náisiúnachais, baisteadh ainm nua Fionlainnise ar Sveaborg, mar atá, Suomenlinna, nó Caisleán na Fionlainne, sa bhliain 1918. Go dtí sin, thugtaí Viapori ar an daingean as Fionlainnis. Le linn an Dara Cogadh Domhanda, bhuamáil na heitleáin Shóivéadacha Heilsincí cupla babhta. I bhFeabhra 1944, hionsaíodh Heilsincí trí uair, agus Stailín ag iarraidh brú a chur ar an bhFionlainn éirí as an gcomhghuaillíocht leis an nGearmáin, ach ina dhiaidh sin féin, ní raibh an damáiste inchomparáide ar aon nós le hiarsmaí na mbuamálacha sa Ghearmáin san am céanna. B'iad Heilsincí, Londain, agus Moscó an trí phríomhchathair san Eoraip nár forghabhadh i rith an Dara Cogadh Domhanda, cé go raibh na tíortha féin páirteach sa chogadh. Bhí cluichí oilimpeacha na bliana 1940 le reachtáil i Heilsincí, ach de dheasca an chogaidh, níor thosaigh na cluichí sin riamh. Fuair Heilsincí cluichí na bliana 1952, áfach. D'athraigh cuma na cathrach go mór, agus na foirgnimh nua-aoiseacha i stíl an Fheidhmiúlachais a tógadh le haghaidh na gcluichí sna tríochaidí, ar nós an Staidiam Oilimpigh, Phálás na Leadóige (Tennispalatsi), agus an Pháláis Ghloine (Lasipalatsi). Sa bhliain 2003, bhí cónaí ar 559,330 duine sa chathair féin. Má chuirtear Espoo, Kauniainen, agus Vantaa san áireamh, is féidir a rá go bhfuil 1.2 milliún duine ina gcónaí i mórcheantar na príomhchathrach. Tá an tSualainnis ó dhúchas ag 6.2 % de mhuintir dhúchasach Heilsincí. Ón taobh eile de, rugadh 7.9 % d'áitritheoirí na cathrach i dtír choimhthíoch, agus saoránaigh de chuid tíortha eile is ea 5.2 % de na cónaitheoirí. An chuid is mó de na heasaoránaigh, is Eastónaigh, Rúisigh agus Sualannaigh iad. Tá teanga choimhthíoch dhúchais (teanga eile seachas an Fhionlainnis nó an tSualainnis) ag 7.0 % de mhuintir Heilsincí, agus is í an Rúisis an teanga atá ag duine as gach ceathrar acu siúd. I gcomparáid le príomhchathracha eile an Aontais Eorpaigh, níl ach Liospóin níos gainne i strainséirí ná Heilsincí. Tá córas cuimsitheach iompair i Heilsincí, agus é á choinneáil ag imeacht ag HKL - Helsingin kaupungin liikennelaitos, nó Foras Iompair Bhardas Heilsincí. Tá idir bhusanna, tramanna, agus líne mearthraenach ag obair sa chathair. Tugtar metro ar an líne mearthraenach, ach murab ionann agus metro Phárais nó underground Londan, tá an chuid is mó de metro Heilsincí ag dul ar an talamh - níl an líne faoi thalamh ach in áiteanna, go háirithe i lár na cathrach. Thosaigh pleanáil na líne mearthraenach chomh luath leis an mbliain 1955, ach níor tháinig an líne in úsáid roimh an mbliain 1982, cúig bliana chun deiridh ar na pleananna. Thairis sin, bhain scannal breabaireachta leis na hoibreacha, agus sa bhliain 1985, ciontaíodh Unto Valtanen, a bhí i gceannas ar chúrsaí pleanála an mhetro, i nglacadh breibe. In ainneoin na ndeacrachtaí agus na moille, áfach, thug muintir na háite taithneamh don líne mearthraenach, agus cuireadh tuilleadh faid leis an mbunlíne in imeacht na mblianta. Táthar ag iarraidh baint de thrácht na ngluaisteán príobháideach, agus níl ach 405 ghluaisteán ag gach míle duine sa chathair - sa tir ar fad, tá 521 ghluaisteán príobháideach in úsáid in aghaidh gach míle duine. An t-aerfort a fhreastlaíonn ar mhuintir Heilsincí, tá sé suite i Vantaa, agus is é an t-ainm atá air ná Aerfort Helsinki-Vantaa. hOsclaíodh an t-aerfort sa bhliain 1952, agus ar ndóigh, b'iad na cluichí Oilimpeacha a bhí mar spreagadh don tógáil. An t-aerfort beag a bhí ann roimhe sin, mar atá, Aerfort Helsinki-Malmi, baintear úsáid as, ach go háirithe, le heitleoirí nua a oiliúint. Tá an Bardas ag pleanáil le fada an áit a chur as úsáid mar aerfort agus tithíocht a fhorbairt ansin, ach is ábhar conspóide é seo i gcónaí. Foirgneamh mór millteanach is ea príomhstáisiún traenach Heilsincí, agus é ina shiombail d'iarnród na Fionlainne ar fad. Na "fir chloiche" os comhair aghaidh an stáisiúin, is móitíf thábhachtach iad i bhfógraíocht an chórais iarnróid ar fad. Mar sin féin, níl sa stáisiún seo ach críochstáisiún. Is é stáisiún Pasila, trí chiliméadar ó thuaidh ón bpríomhstáisiún, an t-acomhal inar féidir dul ó thraein go traein. Ós rud é gurb ionann leithead idir na raillí san Fhionlainn agus sa Rúis, bíonn na traenacha ag dul go Cathair Pheadair agus Moscó gan deacrachtaí. Tá seacht scoil tríú leibhéal ag obair i Heilsincí: Ollscoil Heilsincí, Scoil Ghnó Heilsincí, Acadamh na nEalaíon, Acadamh Ceoil Sibelius, Scoil Ghnó Sualainnise Heilsincí (Svenska handelshögskolan), Ollscoil na nEalaíon agus na Dearthóireachta, agus Acadamh na hAmharclannaíochta. Tá 48,000 mac léinn ag staidéar sna hollscoileanna seo. Tá sé pholaiteicnic sa chathair freisin, go háirithe Stadia, Helia, agus Arcada, agus 19,000 dalta ag foghlaim a gceirde iontu. Thairis sin, cuirtear ranganna oíche agus aosoideachais éagsúla ar fáil. I ndeireadh an tsamhraidh a thosaíonn Féile Heilsincí, nó Helsinki Festival as Béarla; is é an t-ainm oifigiúil atá ar an bhféile as Fionlainnis ná Helsingin Juhlaviikot, a chiallaíonn Seachtainí Féile Heilsincí. Dháiríre, maireann an fhéile cupla seachtain, agus í ag tairiscint imeachtaí éagsúla cultúrtha, idir cheolchoirmeacha, taispeántais ealaíne, amharclannaíocht agus eile. Is é an 12ú lá de Mhí an Mheithimh "lá náisiúnta Heilsincí", agus is gnách é a cheiliúradh le siamsaíocht agus le cultúr den chineál éadrom. Is í an cheolchoirm i bpáirc Kaivopuisto an chuid is suntasaí d'imeachtaí an lae. Cuireadh tús leis an gceolchoirm sa bhliain 1985, agus bíonn an bhéim ar an rac-cheol. I Mí Iúil a cheiliúrann lucht leanúna an rac-cheoil throim Tuska-festivaali, nó Féile na Péine. Is í Rakkautta ja Anarkiaa ("Grá agus Ainriail") an fhéile scannánaíochta is tábhachtaí sa chathair. Maireann an fhéile seo beagáinín thar aon seachtain amháin, agus í ag tabhairt spléachadh ar scannáin nach mbíonn le feiceáil ar na gnáthphictiúrlanna. Tá go leor forais thábhachtacha chultúrtha suite i Heilsincí, ar nós Ateneum, nó Dánlann an Stáit; Kiasma, arb é músaem na healaíne comhaimseartha; Áras Náisiúnta na Ceoldrámaíochta nó Suomen Kansallisooppera; agus a lán amharclann, go háirithe an Amharclann Náisiúnta, nó Kansallisteatteri, agus Amharclann Chathair Heilsincí, nó Helsingin Kaupunginteatteri. Bíonn Ceolfhoireann Chathair Heilsincí (Helsingin Kaupunginorkesteri) ag seinm in Áras Finlandia, ach thairis sin, tá ceolfhoireann chlúiteach phroifisiúnta eile ag obair sa chathair, mar atá, Ceolfhoireann Shiansach an Raidió nó Radion Sinfoniaorkesteri (RSO). An cuairteoir a rachadh ar lorg an rac-cheoil i Heilsincí, ba chóir dó aghaidh a thabhairt ar Chlub Tavastia thar aon áit eile. Páirc Esplanadi i gceartlár Heilsincí. Senaatintori, nó Cearnóg an tSeanaid - fíorchroí na cathrach. Cearnóg an Mhargaidh i Heilsincí, agus í clúdaithe le sneachta. Tá Músaem Náisiúnta na Fionlainne suite i Heilsincí. Pohjoisranta - An Trá Thuaidh - san oíche. Is síol faoi thíreolaíocht na Fionlainne (DPS) é an t-alt seo. Cuir leis, chun cuidiú leis an Vicipéid. Tugadh an leathanach seo cothrom le dáta an 30 Deireadh Fómhair 2018 ag 13:41.